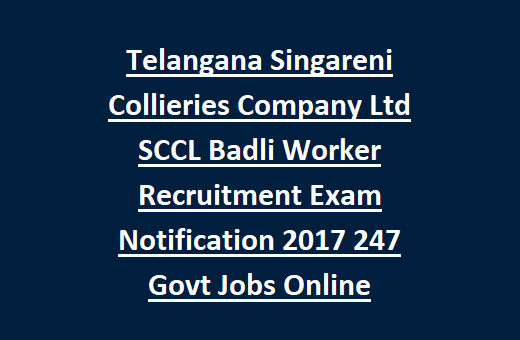 SCCL Badli Worker (Under Ground) Recruitment/Exam-2017: Singareni Collieries Company Ltd SCCL Invites applications from the Telangana State ST candidates only for the available Badli Worker (Under Ground) jobs of NCWA cadre on daily wages of temporary basis. There are total 665 vacancies available in this SCCL Badli Worker Jobs Recruitment. 133 vacancies open to all local and non local candidates and 532 Badli Worker jobs are only for local candidates of Adilabad, Khammam, Warangal and Karimnagar District candidates. Online applications for this SCCL Badli Worker jobs are available from 07-08-2017 to 02-09-2017 via the SCCL official website of www.scclmines.com. Selection for this SCCL Badli Worker Jobs will be held through written exam only. 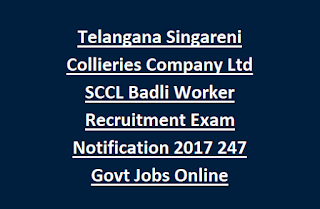 For more details regarding this Badli Worker Jobs of Singareni Collieries Company Ltd SCCL Recruitment Notification is given below. For this Badli Worker jobs in Singareni CCL candidates must have qualified SSC or 10th class or its equivalent. Selection will be held through Written Exam of 10th standard for this Badli Worker jobs. Objective type multiple choice written test will be conducted. Exam paper will be in Telugu Language only.